The Hollywood Brown Derby Lounge has been working on becoming the spot to see and been seen for quite some time now. With top-notch small plates and a bevy of finely crafted cocktails, is it any wonder that guests have found this little alcove to be their perfect spot to relax while at Disney’s Hollywood Studios? Granted, the serene Hollywood of old feel the lounge and background music loop provides can occasionally be shattered by the booming pyrotechnics of Star Wars: A Galaxy Far, Far Away, but most of the time the scene is perfectly set for a small party to unwind. We’ve been working our way through the menu of The Hollywood Brown Derby Lounge slowly with our reviews, and today we’ve come up against another trio of beverages to sample in the name of research. 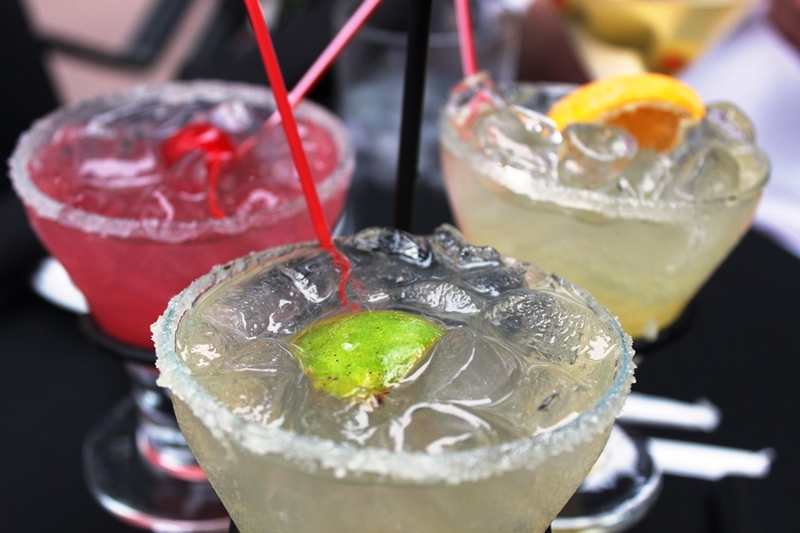 The margarita flight features three specialty margaritas; Classic, Mango, and Pomegranate. While each can be ordered separately, we tackled the trio today in order to give you as thorough of a review as possible. Each margarita is prepared with Sauza Conmemorativo Tequila and sweet-and-sour, but from there they all become drastically different. The Classic Margarita features Cointreau, Lime Juice, and a Grand Marnier Float. The Mango Margarita adds Cointreau as well, but also includes Mango Juice. Last, but certainly not least, is the Pomegranate Margarita which includes Stirrings Pomegranate Liqueur. These are all well-prepared and it really comes down to what you are looking for in an adult beverage. For sweetness, I recommend the Mango Margarita. It isn’t an overly sweet cocktail, but it is sweeter than its counterparts in this trio. The Pomegranate Margarita packs in the tartness, as one would expect from something that includes pomegranate, but the flavors hold up and make for an excellent addition to the flight. Then there is the Classic Margarita, which expertly blends its sweet and sour elements to make something that can be considered traditional, but also has its own personality thanks to the Grand Marnier float. You’re not going to find a bad margarita in the set, but if you’re craving something in particular, then I would recommend against the flight and focus in on what you’re really looking for in a margarita. These cocktails from The Hollywood Brown Derby Lounge may not be up to the ridiculously high standards set by La Cava del Tequila, but they most certainly hold their own.